To identify areas of strength and weakness in order to aid planning To provide data for the Local Authority and Government! 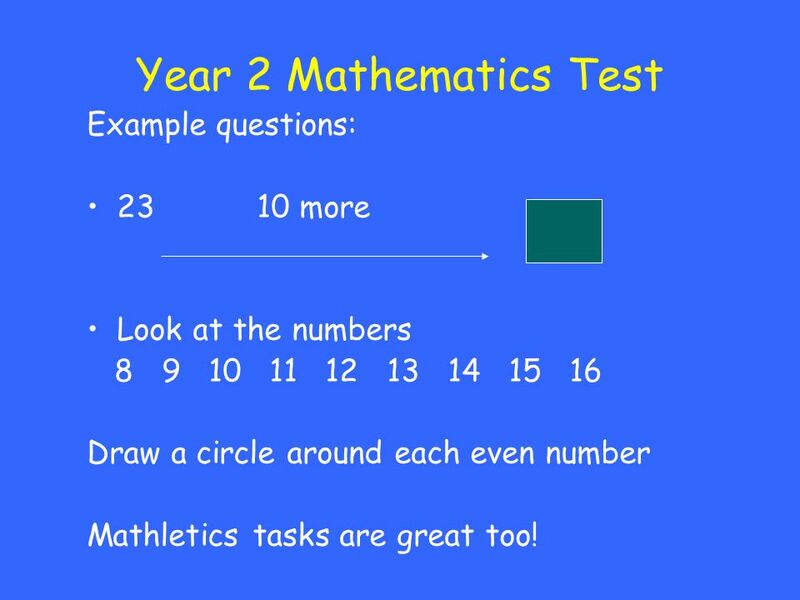 Look at the numbers Draw a circle around each even number Mathletics tasks are great too! 8 Level 2 and Level 3 papers Children will take the Level 2 papers. 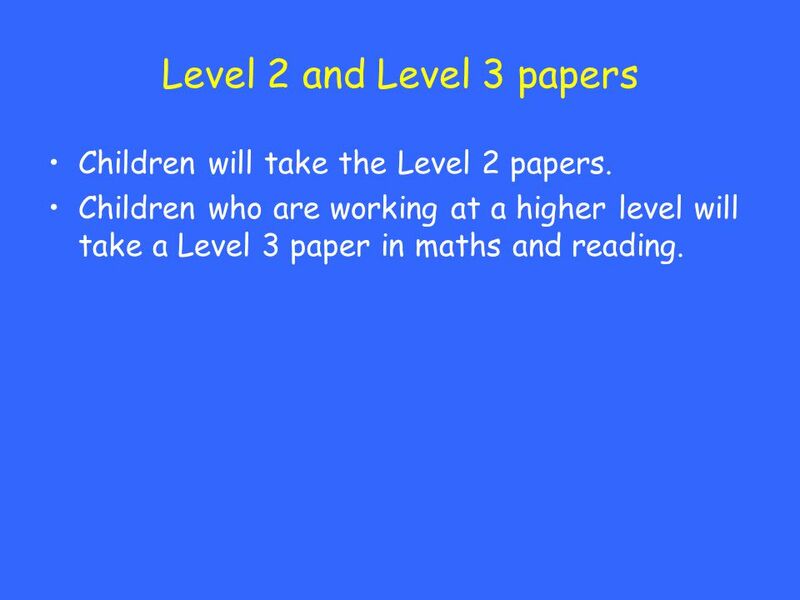 Children who are working at a higher level will take a Level 3 paper in maths and reading. 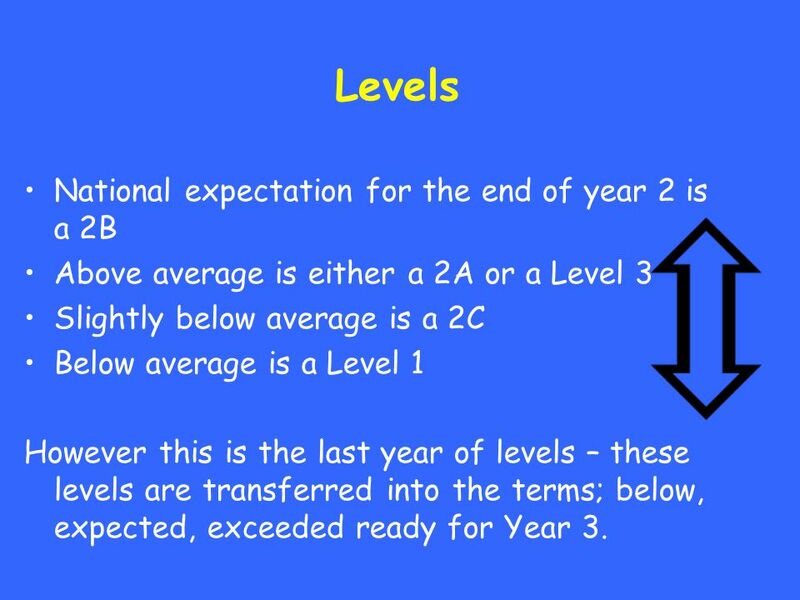 Above average is either a 2A or a Level 3 Slightly below average is a 2C Below average is a Level 1 However this is the last year of levels – these levels are transferred into the terms; below, expected, exceeded ready for Year 3. 12 Any Questions? 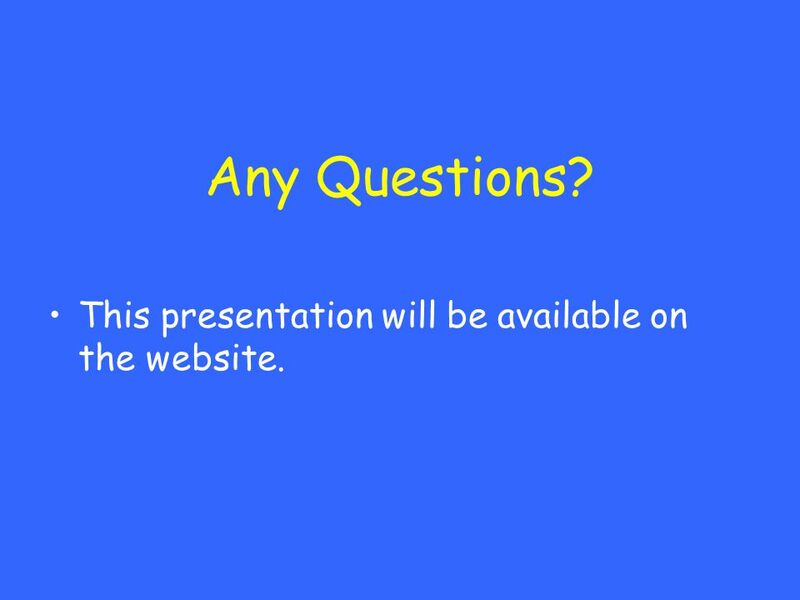 This presentation will be available on the website. 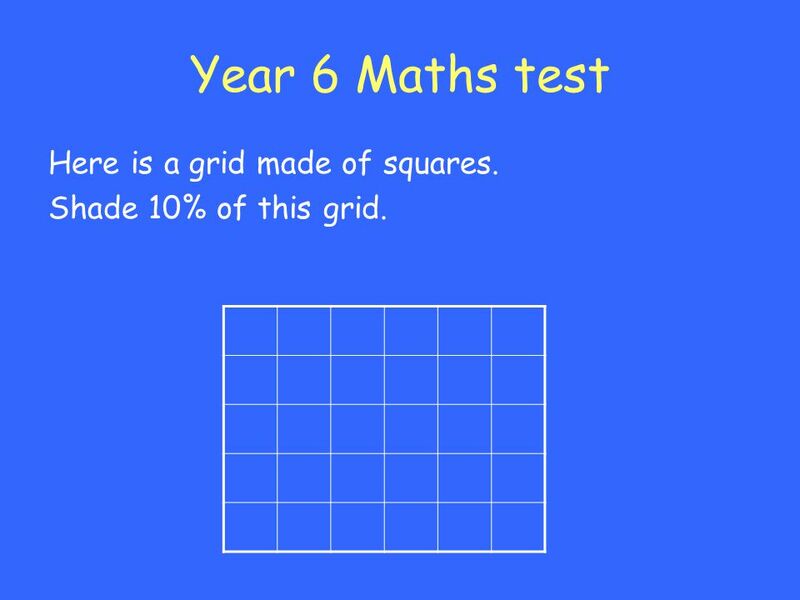 15 Year 6 Maths test Here is a grid made of squares. Shade 10% of this grid. 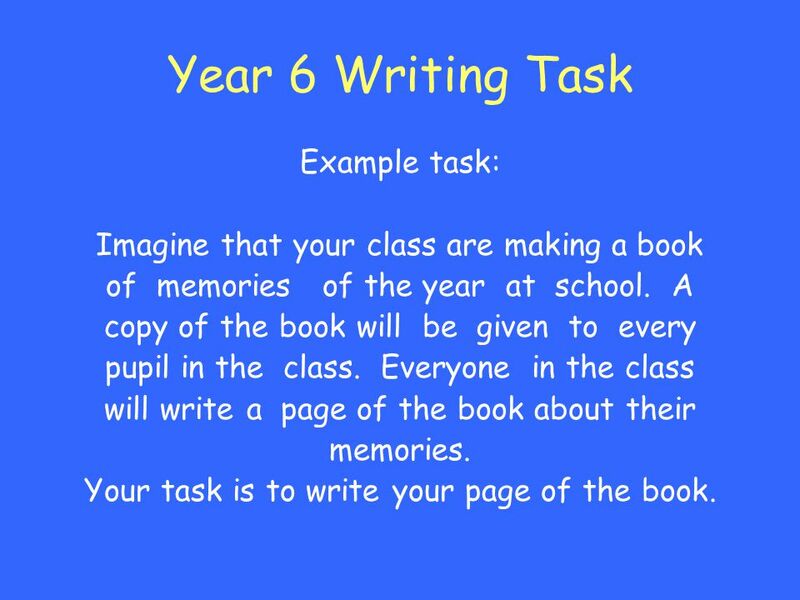 16 Year 6 Writing Task Example task: Imagine that your class are making a book of memories of the year at school. A copy of the book will be given to every pupil in the class. Everyone in the class will write a page of the book about their memories. Your task is to write your page of the book. 18 What can you do to help your child? 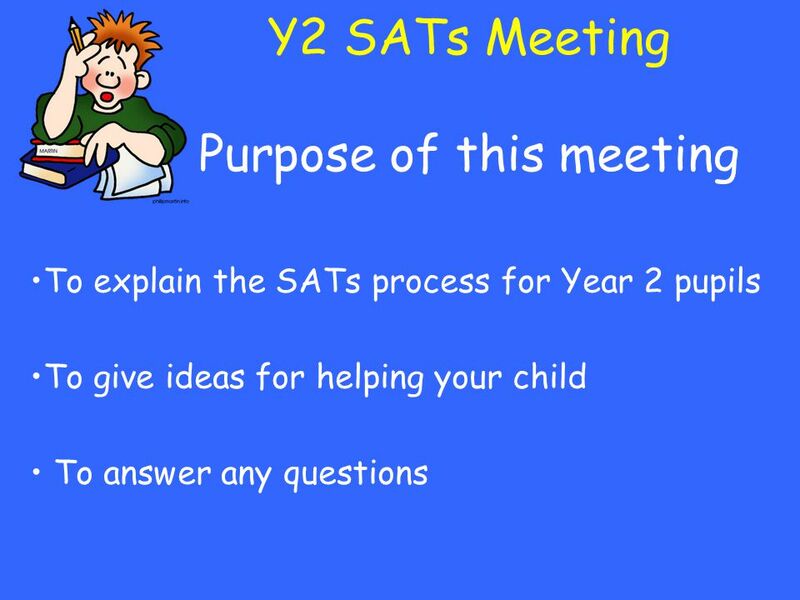 Download ppt "Year 2 and Year 6 SATs meeting"
Year 6 SATS Information. What are SATS? 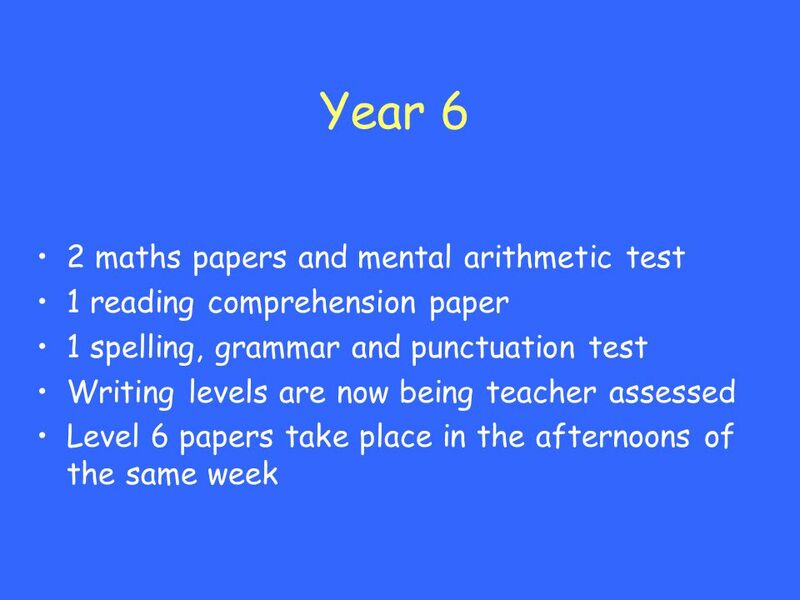 KS2 Sat’s are taken by pupils in Year 6 as part of a National Curriculum assessment Programme. Standard Assessment. A Parents Guide to Key Stage Two SATs A Parents Guide to Key Stage Two SATs. 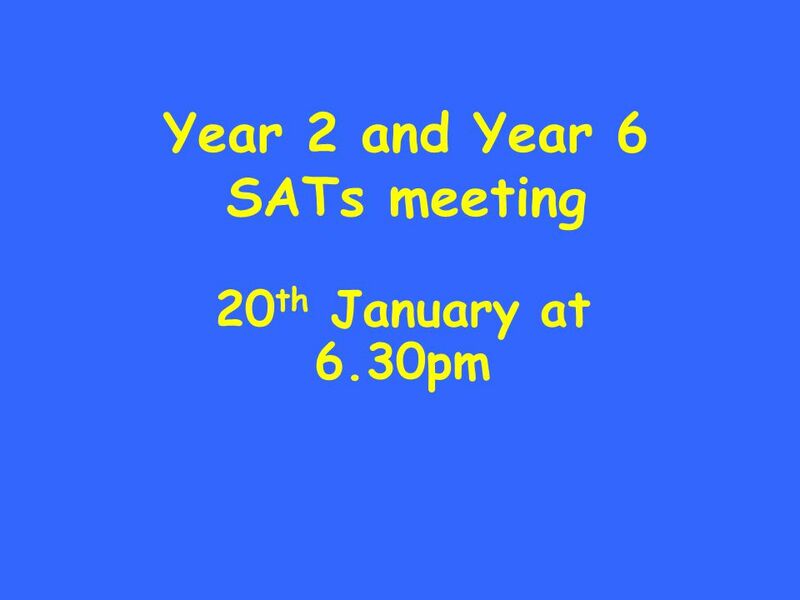 SATs Meeting 29 th Jan What are they? SATs (Standardised Assessment Tests) (Statutory Assessment Tests) National Curriculum Tests (NCTs) English. 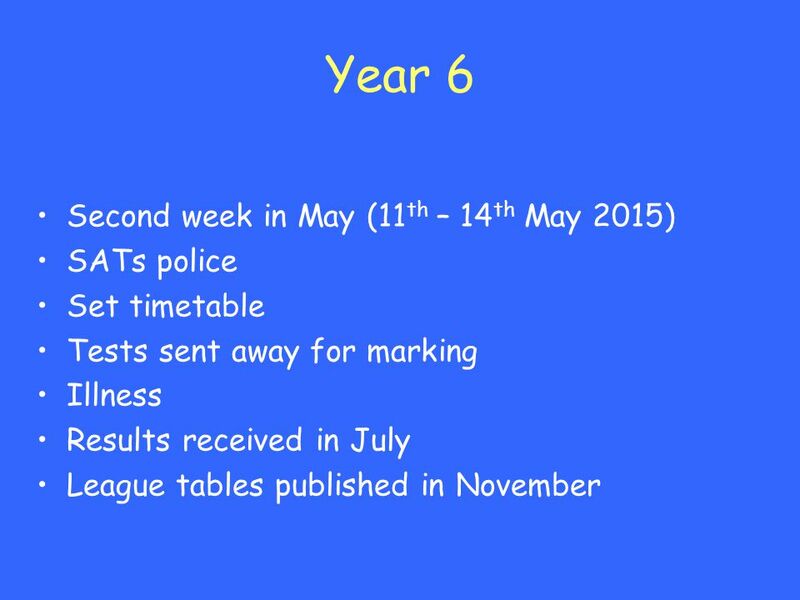 Year 6 SATs Tests th to 14 th May. 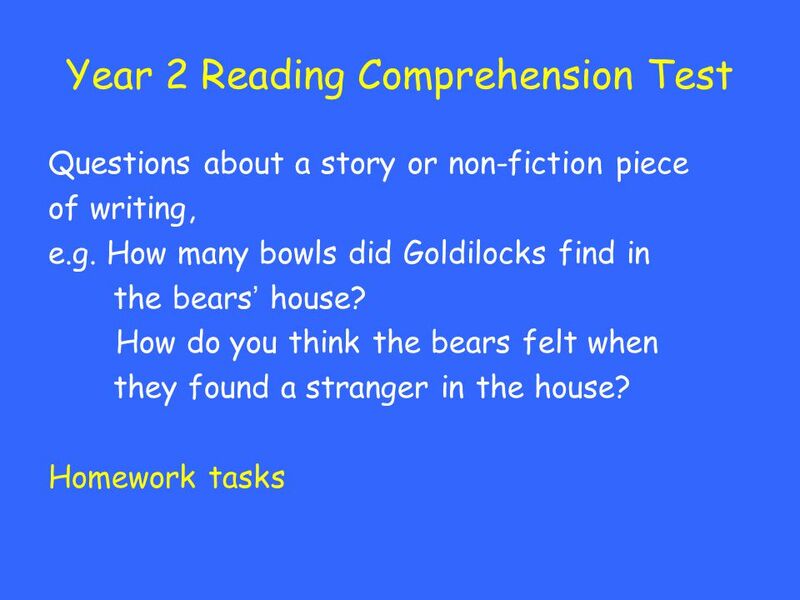 What are KS2 SATs Standard Assessment Tests All children have to be tested before they go to High School Provide. Year 2 SATs Information Evening Thursday 5th March 2015. SATs tests – information for Year 2 parents. What are SATs? 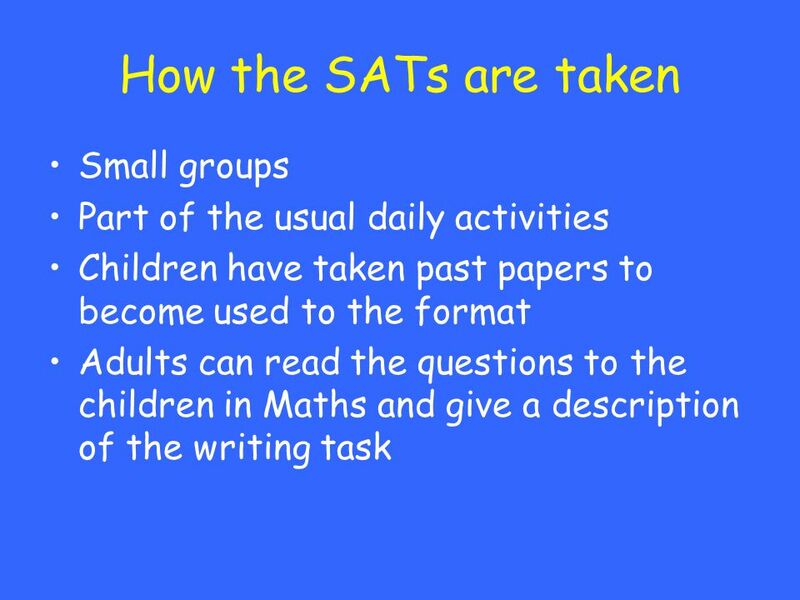 SATs stands for Standard Assessment Tasks (and Tests) It is compulsory for all state schools. Information for Parents on Key Stage 2 SATs March 2015. Welcome to Year 2 Behaviour expectations Good manners Good manners Respect Respect To follow school and class rules To follow school and class rules. National Curriculum Assessments. Parents Information 2015. 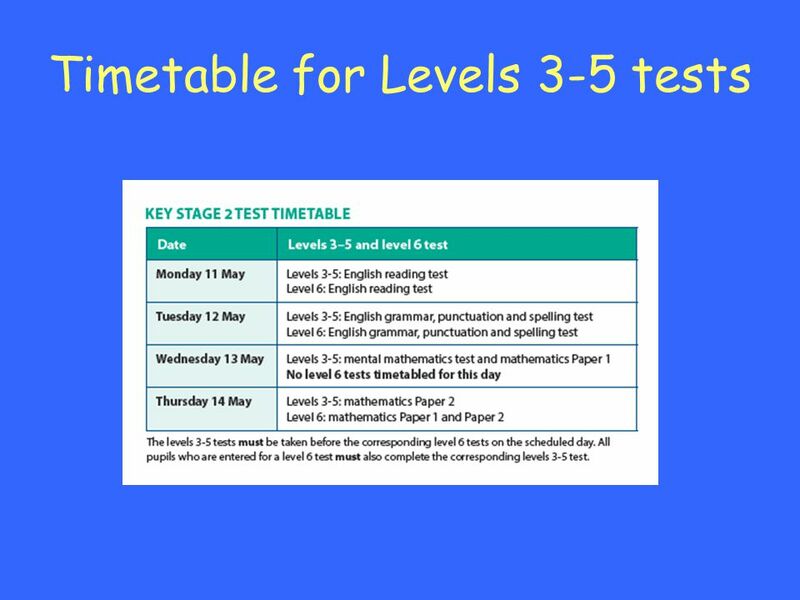 Year 6 SATs Tests th to 14 th May. 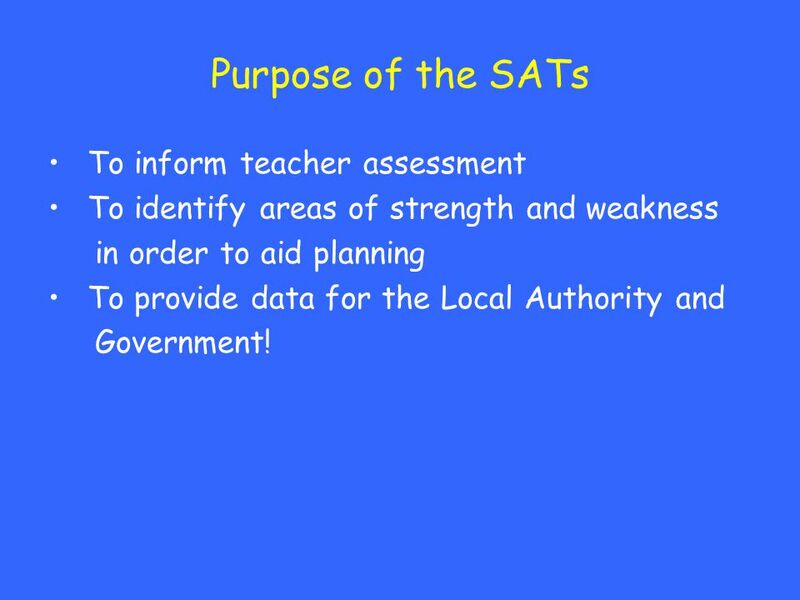 What does SATs Stand For? 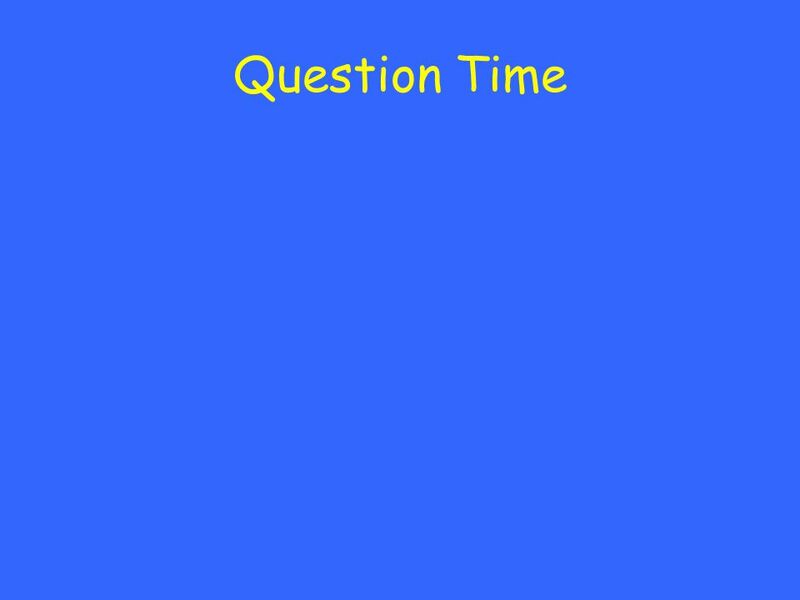  Statutory Assessment Tasks and Tests (also includes Teacher Assessment).  Usually. Welcome to the Year 6 SATs meeting. 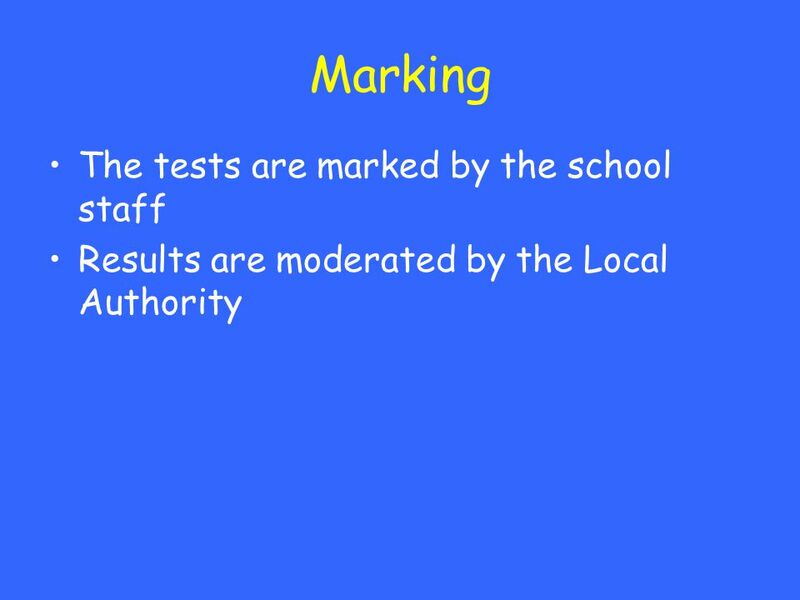 Purpose of the meeting To gain an understanding of the tests and what the attainment levels mean. To receive information. Longmoor Primary School KS2 SATS 2016 Y6 Information Evening Monday 5 th October 2015. Information for Parents Year 6 SATs January 2012. 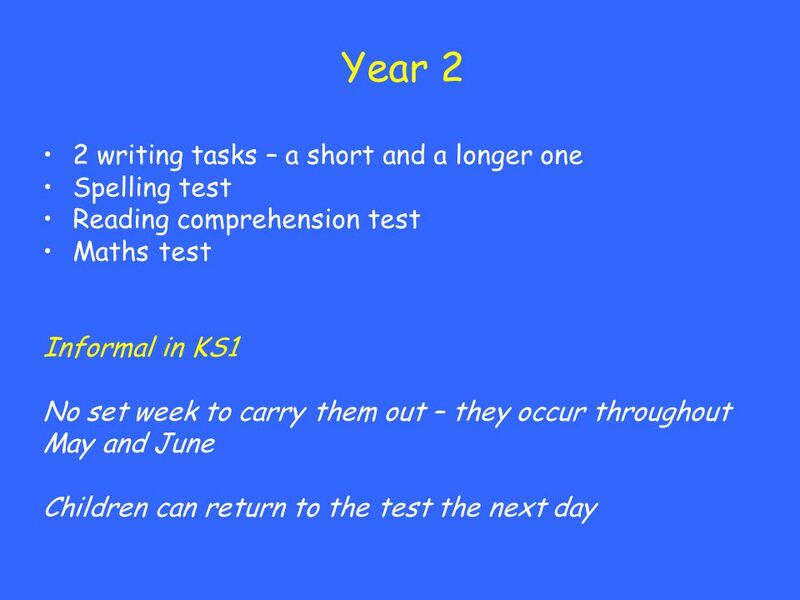 KS2 end of Year 6 Tests 2016 Information evening New curriculum.